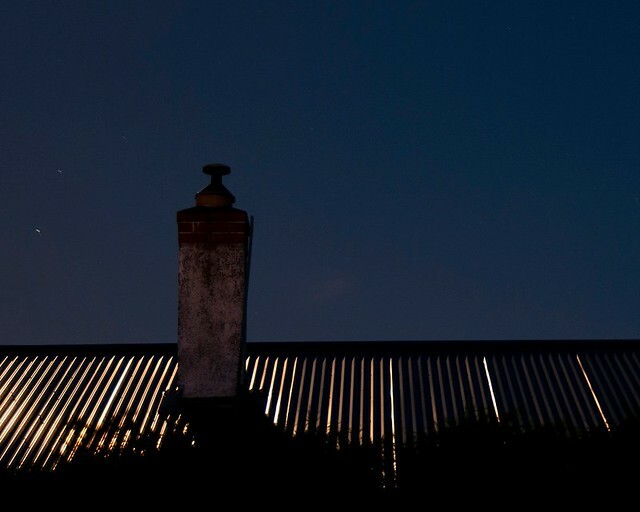 This was taken looking over the garden fence - a very bright moon refelcting on the neighbour's roof. When I took the picture I could only see the brightest star at the top of frame, but on screen there seem to be quite a few more stars. Light trails of traffic over a bridge - this was a big truck, so the headlights are higher and show through the railings of the bridge, and the lights on the top of the cab left a colourful streak too. I dodged the trees behind the bridge, and have burned a few of the brighter lights on the left hand side - anything else I could/should do? Id crop most of the sky out and submit the roof! nice image, the bridge works fine for me. I agree with Mark on this. I'm not sure that having the star at the top included actually adds anything. The image is the roof. That's the main point of interest and what, I suggest, you want to showcase. Also, I'd work some more on the crop. Not sure about the satellite dish being there and it's very close to the edge of the frame. 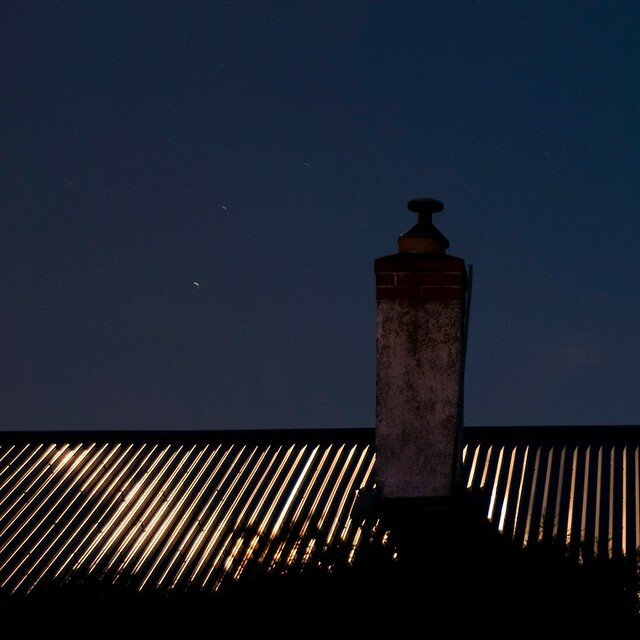 What grabs me are: a) the roof; b) the chimney and, c) the two brighter stars to teh left of the chimney stack. Building a, say, 5:4 or 7:5 ratio crop around them, with the chimney stack on the vertical third (right or left - need to try both) would, I think, maybe give you an image worth thinking about. On the bridge, my only question (because it's a good 'un) is what would it be like if you kept the same ration, but re-composed to include just a bit more above the bridge and little less of the reflection at the bottom? Would that produce a different 'balance' that was an improvement or not? Last edited by Donald; 9th November 2011 at 07:13 PM. I am presuming you took that image sometime in Sept. or Oct.? have also captured the star "Aries" underneath Sheratan. to show the other stars, as the sensor is much more sensitive than our eyes are. and it is difficult to provide any sidereal tracking when using a standard tripod mount. p.s. Removed just the star trails in the pic attached. Last edited by Dizzy; 9th November 2011 at 07:20 PM. Thanks everyone for all the feedback and suggestions I can't do anything with the images at the moment (at work) but I will try some of the suggestions tonight and post them. Donald - I'll try a few different placements and ratios for the crop, making sure not to get the chimney dead centre I want to try and leave the light stripes on the roof at the right hand side, so may need to clone out some of the satellite dish, rather than crop it completely. The sky was very overcast and boring the night I took the bridge picture so I wanted the focus to be on the swirling water (river running very high, fast and muddy!!) but much of the swirling effect in the water is lost with the long exposure, it actually looks fairly flat and tranquil in the picture which it certainly was not (it's one big scary river!!). 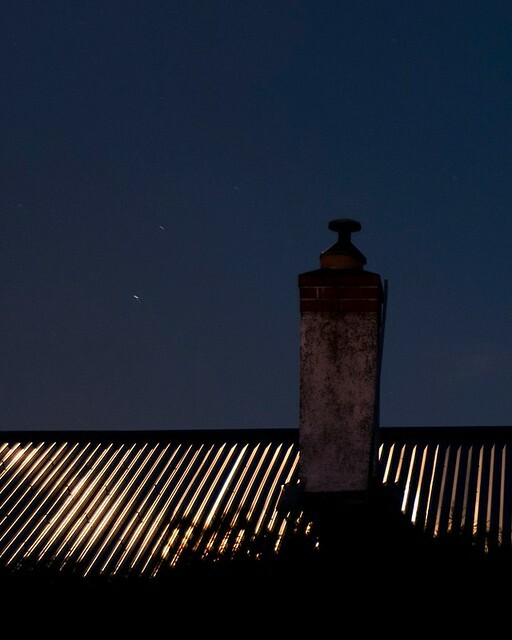 Dizzy Mike - thanks for the astronomical information The picture was taken in the deep south of NZ just a couple of nights ago, looking in a roughly north-easterly direction. 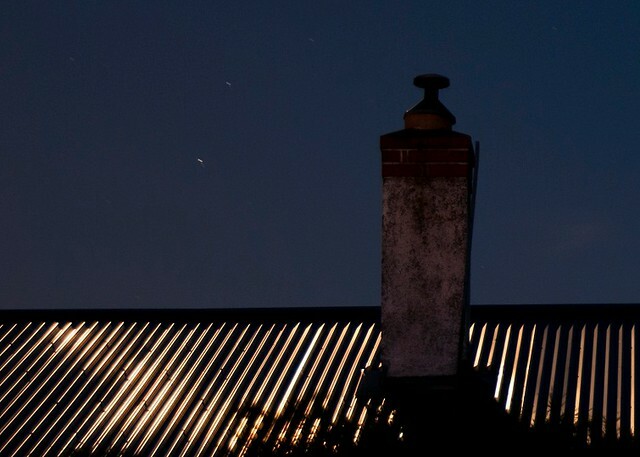 I did make some more images about an hour or so later, but the moon had moved so much that the light on the roof was not as spectacular. There are a few trees that I was trying to get silhoutted in the image but it was so windy that that idea didn't work! I cropped most of the sky from the roof picture - not sure it is quite right yet, the chimney is a little too central for my liking. The sky is very clear tonight and should stay clear after dark too - I'll try this shot again. I agree. You are going to have to sacrifice some of the roof to get the chimney in the right position. I used a rule-of-thirds grid to determine the composition in each case. I don't mind at all, all suggestions are welcome I hadn't thought about removing so much of the hedge, but once it is gone the eye is drawn much more to the lines of light on the roof. All times are GMT. Page last updated at 10:25 AM.